UK Metal Detecting Under the Microscope: Is the end of “Responsible Artefact Hunting” nigh? It will put archaeologists in a tricky spot [...] So watch this space, interesting times are coming. will even notice that they've been put in a tricky spot. 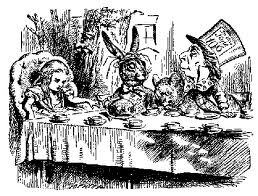 They do not seem too inclined to notice their already ambiguous position, why should they wake up only now? The efforts of Lincolnshire Police to combat heritage crime are being showcased at a Lincoln museum this month (open until December 21). The exhibition, which is designed to explore heritage crime issues and the way in which Lincolnshire Police tackles them, features a number of display cases and a talking heads video. One of the display cases features items seized in Operation Totem, a joint-agency investigation to tackle illegal metal detecting in the county. PC Nick Hanson said: “Heritage crime is an issue in Lincolnshire and it is vital that we raise awareness. We do successfully investigate and prosecute in this area and we need to get this message across. The pictured artefact, a golden egg-shaped piece, is just one of man beautiful unique Lincolnshire finds that should be in a museum, not in a criminal’s private collection...”. I suppose one question that arises is does it matter who the owner of the private collection is (criminal, clergyman, drug addict, lawyer) if the object is illicit? Can someone from PAS or the detecting community, or maybe Lincolnshire police, please explain this? I dont know if the recent post by coin dealer Sayles ("Barford calls on Coin Collectors to Study and Publish") is some kind of a guffawing Ozark hillbilly-type joke as close friend Arthur Houghton-by-proxy suggests, or whether Sayles simply assumes thinks his readers are all stupid. Or perhaps the man from the Ozarks getting confuddled himself. In a recent internet blog post ('Arab Spring Sayles: Islamic Coins Reach new popularity', Monday, 26 November 2012) I refer [among other things ignored by Sayles] to the Rev. James Theselius Collection (JTC) of Islamic coins being sold at the WGS Store. One might forgive Mr. Barford, who has no measurable background in numismatics, for failing to realize that this is precisely what did happen over the twenty or more years that JTC was formed. Many of these coins were studied carefully by a host of scholars who contributed to the data compiled in the two volumes of Turkoman Figural Bronze Coins and Their Iconography by William F. Spengler and myself. There then follows a long name-dropping list of those academics involved in that publication, intended no doubt to bolter the prestige of the writer. The trouble is that the two volumes of William F. Spengler and Wayne G. Sayles, Turkoman Figural Bronze Coins and Their Iconography, Volume 1: The Artuqids and Volume 2: The Zengids , were actually published in 1992 and 1996 respectively. Yet according to Sayles, the Theselius collection was assembled "over the past two decades". Thus its assembly was begun at the earliest in 1992, just as the first volume of the book in which Sayles says the collection is published was already in press. How then can the Theselius collection of Artuqid coins be published by Spengler and Sayles if the collection was only assembled after the volumes were already in the bookshops? Those of the 60 or so 'JTC' Artuqid coins from the Theselius collection that Sayles is offering that actually have any information about their source only give their collecting history as far back as the sale where Theselius bought them, Sayles offers no information at all where most of them were before that. The acquisition of these coins by the Theselius collection are mostly from purchases subsequent (sometimes by over a decade) of the alleged publication of the Theselius collection by Spengler and Sayles. Now I may not have a "measurable numismatic background", but I can tell an untruth when I see one, and it seems to me that, contrary to what Sayles asserts, the Rev. James Theselius collection is NOT published in William F. Spengler and Wayne G. Sayles, Turkoman Figural Bronze Coins and Their Iconography. As for the Theselius collection allegedly overlapping the Spengler-Sayles collection, a moment's search will reveal that Stephen Album has been selling off parts of the latter. More on that later. the authors were warmly received in person by every one of these numismatic scholars at their institutions and often for several days of intensive study and collaboration. This is typical of the turncoat logic of coineys, when it suits them to stress why dugup artefacts should be freed from institutional curation, museums are bad things. When it suits them to stress the respect with which they, mere amateurs, were treated by these "distinguished [...] scholars", then out comes the list of institutions where they were treated to "intensive study and collaboration" and warmly received. So which is it, exclusion or collaboration? There really is no underlying logic to coiney arguments, they say whatever they feel like saying at a given moment, no matter that it contradicts what they said a few days earlier. I ask again, where is the publication of the James Theselius collection, written by collector James Theselius, both the Islamic coins and the Roman Egypt ones mentioned in an earlier post? Let Sayles unequivocally give an answer - the bibliographic reference to the full publication of this important collection which he is currently selling off piecemeal. A few days ago Wayne Sayles falsely announced to his readers that "Archaeologist Barford" had "endorsed" his online coinshop. I had done nothing of the kind. He then went on to claim that the Rev James Theselius collection of Islamic coins that he was selling there was fully published. On examination of the evidence, the latter claim turns out to be untrue. The collection of Artuqid coins for example, where there is any information on the origin of the coins in this collection, seems to have been assembled AFTER this supposed publication. In going through that sorry array of dugup artefacts in order to establish this, I had occasion to examine the manner in which the collecting history of the items being sold by the Executive Director of the Ancient Coin Collectors' Guild is presented. It is not impressive. So how many of the dugup antiquities that Wayne Sayles acquired from the Rev. James Theselius collection and is now offering for sale (with a "guarantee of clear title") can be traced back to legal, or licit origins before 1970? I just looked through the Artuqid coins in connection with the claim that they were published in "Turkoman Coins vol 1 (1992)". Two thirds of the sample therefore have no documented collecting history prior to Rev. Theselius buying them. They just "surface" in the past two decades. JTC-060 Ex Gemini II, lot 564. JTC-181 Ex CNG 41, lot 2713. JTC-184 Ex Jean Elsen 82, lot 917. JTC-106 Ex Jean Elsen 92 lot 1369. So, of 63 coins only 20 have any kind of collecting history. Most of these sales, where they could be identified, were relatively recent. All but two however are 'second generation' information, they tell the name of the auction where the object was purchased. Again these objects are freshly "surfaced" (from "underground"?) Only in two cases do the collecting histories go back to who had it before the auction. In no case in this sample is any information whatsoever offered about how and when the item left the source country, and about the legality of that movement across the borders of that country. This is notable because Turkey has blanket vesting legislation going back in its modern form at least until 1906 (revised in 1983). Mardin, where most of these coins were issued is near the Syrian border, it might be argued that some were dug up in Syria or further to the SE in Iraq, but the same problems exist with the legality of possession in the country and export. In Syria for example, article 4 of the Antiquities Act. Or are collectors expected by the dealer to be ignorant and unconcerned en masse about any of that? So how and when did the coins Mr Sayles is selling leave the source country? How can they be openly on sale if the seller's answer to that question is "I do not know, but they are here now"? Just because dealer Grebkesh and Runn had an object in their auction in 1987 does not absolve anyone from due diligence when any reasonable cutoff date for licitness or legality is well before that. In my opinion, if the coin cannot be shown to be exported legally (ie the seller has a copy of the export licence which can be supplied to the buyer) or cannot otherwise demonstrate that the object came from the actual source country before the applicable legislation was enacted, then the responsible dealer should pass up the opportunity to incorporate a tainted object in their stock. In fact, that would be my definition of a responsible antiquities dealer. I assume from looking at what he is selling that Mr Sayles has another definition of "responsible dealing" (which includes giving guarantees for which it seems in the case of the coins listed above he has no real documentary basis - unless he means merey "they-can't-touch-you-for-it-clear-title" rather than moral clear title). That is why, despite what he would falsely claim, the "WGS Antiquarian" coin shop most certainly does not have the "endorsement of archaeologist Barford". So, somebody is making a tidy profit out of denying the distant brown skinned Oriental Gentlemen a 'fair trade' and taking the coins out of the local market and profiting from selling them to outsiders. Let us note that in part the market value of the objects is additionally enhanced by the writing of the book on the basis of some of Mr Spengler's coins. 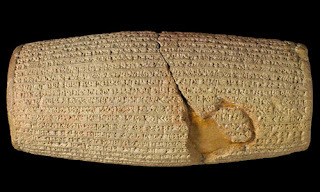 the Cyrus cylinder records how the ruler allowed deported peoples to return to their homelands and ushered in an era of religious tolerance in his new, multiethnic empire. For Jews and Christians, it is the object that – along with passages of Isaiah – records the end of Jewish exile in Babylon. In Iran, it has by turns been used as a symbol of the shah's power and, most recently, when the cylinder toured to Tehran in 2010, was adopted as a rallying cry for Palestinian freedom by the president, Mahmoud Ahmadinejad. For others, it is the first declaration of human rights, and an international symbol of religious tolerance. For Neil MacGregor, director of the British Museum, to which it belongs, it is the "first press release". "Our role is to represent this as an object in the history of culture," said MacGregor, "but what is fascinating is the reading of the objects by others". Curtis added: "In a way, it doesn't matter so much what the document actually says, so much as what people think it says." The touring exhibit is part of the British Museum's policy of making the collection available as widely as possible "either online or on loan", said MacGregor. An exhibition of Egyptian artefacts recently opened in Mumbai; the museum is also working with institutions in China, Hong Kong and Australia. After its tour to the US, the Cyrus cylinder will itself head to Mumbai. The museum also supports permanent displays and touring exhibitions in regional institutions in Britain. Charlotte Higgins, 'Babylonian relic to visit US with historic message of tolerance', The Guardian 27 November 2012. Christie's claims on its website "world-class security, management and expertise" but given the sheer volume of works of art that pass through it, there was bound to be some mishap. Reportedly gone missing is a 2007 artwork by Douglas Gordon (called "The Left Hand and the Right Hand Have Abandoned One Another"). It should have been in store at Christie's high security warehouse in King's Road London, it was signed in on 28th October, but a few days later an employee noted that the box which was supposed to contain the solid gold piece - with a scrap value alone of £250,000 - was suspiciously "light". When it was opened, the sculpture was found missing. The artist accuses Christie's of a delay in informing the work's owner and creator of the theft. Charlotte Higgins, 'Turner prize-winner's work stolen from Christie's', The Guardian, 29 November 2012. [Update: see also BBC News, 'Douglas Gordon 'outrage' over work stolen from Christie's', BBC News 30 November 2012]. "On the Wrong Side of History"
On Thursday 29th November the UN general assembly voted overwhelmingly to recognise Palestine as a state. Readers will remember that the previous recognition of Palestine by UNESCO prompted the US - who all along opposed it - to stop funding the organization. 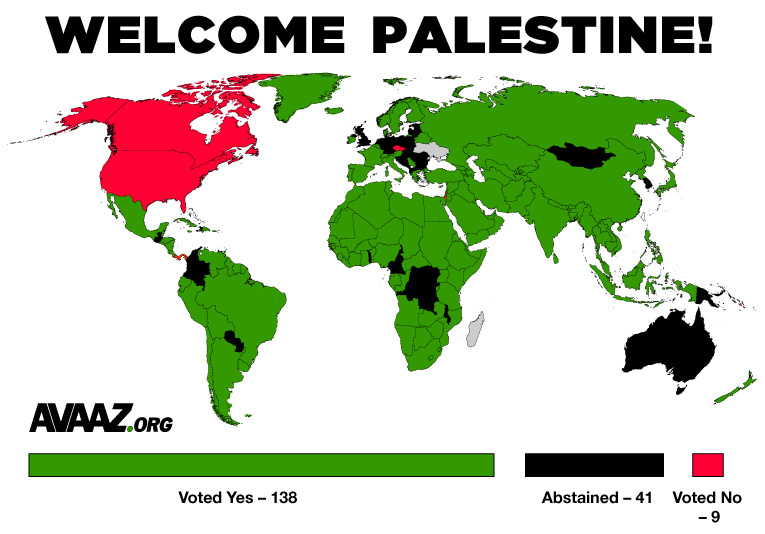 This new vote illustrates the isolation of the US. While 138 nations voted to give the Palestinian people justice, "just nine countries ended up on the wrong side of history: Israel, the US, Canada, the Czech Republic, Panama, Palau, Nauru, Micronesia and the Marshall Islands". A few weeks ago, the vote was expected to be much closer, with Israel and the US lobbying hard to deny Palestine key European support. But in the face of major public pressure [...], countries such as France, Spain, Belgium and Sweden decided to vote yes to statehood for Palestine. Sadly Poland, who herself only relatively recently recovered statehood after 123 years dominance and repression under rule of neighbouring countries, abstained from the vote, as did most of eastern Europe. Avaaz Team, 'See who voted for Palestine', 29 November 2012. The Associated Press covers the results of the voting, the Guardian covers the activities of Avaaz two weeks ago and Haaretz describes Israel's response. "We are struggling to deal with all the finds that are coming in. We have 39 locally-based finds liaisons officers but we have enough work for twice that number”. Hmm. Obviously these people would be busting a gut to record eight finds a day. One Roman coin or buckle an hour? This workload is coming from 4503 "finders". Now of those 1076 records were generated in 2011 by chance finders (agricultural, building, gardening, dog-walking). How many of those finders generated multiple records? Then another 3834 records were generated, not by members of the public but by archaeologists, the vast majority from fieldwalking (why are fieldwalking surveys being processed by the PAS?). That means that of the 4503, possibly as few as a half are actually not ordinary members of the public, or sneaky archaeologists getting the PAS to do their work for them, but artefact hunters. They generated between them over 50900 of the records. So what basically Roger Bland is saying is that artefact hunters (the ones that report finds at all) are currently removing archaeological finds at a rate twice as fast as we have the means to record them, let alone get those who are currently NOT reporting finds to come forward. In order to keep heads above water and get the missing information recorded, Britain needs to double its current spending on the Portable Antiquities Scheme right away. If this is not done, sites and assemblages are being dismantled with no hope of there being even the barest, most simplistic or mitigation. If the funding is not taken away from other areas of public expenditure and the PAS funding immediately doubled, then perhaps other means should be sought to curb the pace of destruction. Or perhaps just shrug your shoulders and walk away, pretend it's not happening. the unwillingness to consider whether it can be adapted in some fashion in countries like like Bulgaria, Cyprus, Greece, and Italy [or France, Mexico, Canada, Pakistan and Iraq]. [...] Perhaps the Bureau of Educational and Cultural Affairs and USAID should consider funding a pilot program. Yes, why don't they do that? Better still, why don't the ACCG join up with the metal detecting organizations and pot-digging and arrowhead hunting clubs in the US to press to have a Portable Antiquities Scheme in every state in the US? Why NOT? Do it, don't keep whining about it. Focus on UK Metal Detecting: Corfe Cleaned Out? amidst lots of hoo-ha about how it was the future and highly beneficial for the viewers. But the cameras are long gone, the collector-boys have kept coming, again and again and again and it’s nearly all been cleaned out … "Archaeology for all", see? It's the fellowhip and hog roast that draws us out. It's a shame though they cannot do the hogroast somewhere else and not as part of the stripping of an archaeological site of the collectable items. Out in the backwoods of Missouri in the Ozark Mountains lives an old man who apparently believes fervently in coin elves and also seems to imagine that he can read my mind. So now, we learn from him that ‘Barford calls on Coin Collectors to Study and Publish' about an earlier post of mine (to which he is unwilling to provide his readers with a link). * What I actually said is here. It can be seen that I was questioning the coiney mantra about the "research" which the majority of collectors do on the coins they accumulate. Sayles' name-dropping comments on a single example of a single book hardly advances the discussion on that more general point. [I will come back to the point made in Sayles' post about the relationship between the two first volumes on "Turkoman coins" and the Theselius, Spengler/Sayles and Tom Cobley collections later; matters are by no means as simple as he tries to make out]. As I have said many times before (so I cannot see why this might now "seem like a dramatic change of tack"), I would like to see all collections documented and that documentation disseminated in the interests of transparency and facilitating following the collecting history of individual items as they move through ephemeral collections. If coin collectors and artefact hunters are indeed engaged in any kind of useful research, then absolutely, I am all for them publishing it and presenting it for discussion and scrutiny. No question about that. What however is the issue is the ethics of this kind of research. Human medical experiments too "can bear intellectual fruits and enrich the understanding of other disciplines", no question about that either. There is however a great difference between using the results of experiments conducted on unharmed, voluntary subjects, and the use of data from experiments done in the Second World War in concentration camps. Nazi doctors gathered data which are potentially useful in several fields of science, but they will never be used as such because medical ethics will not allow their use. An extreme example, certainly - but the point is the fact that there are cases where ethical issues override the value of the data. You could say the same about any field of science where the data are gained from cruel or distressing experiments, or are stolen from somewhere else. The ethical issues rule out their use in a responsible discipline. Why is that not the case with ancient dugup artefacts each of which represents the unmitigated destruction of another portion of the finite and fragile archaeological record? There is responsible and ethical way to collect coins and artefacts to study, and an unreflexive approach which asks no questions about where the basic source material is coming from. What I do want to see is collections made only of demonstrably responsibly (and licitly) obtained artefacts and properly documented. Now, personally, I think I express that quite clearly, but it seems some people have difficulty attaching meaning to the words. *Odd, isn't it, that now three ACCG blogs, Peter Tompa, Dave Welsh and now Wayne Sayles (despite an earlier assurance) have a series of posts about "Barford" rather than ancient coin collecting. Have these people really nothing else to write about? Is the intellectual landscape of ancient coin studies currently so barren? It seems there has been a lot of discussion recently about the seeding of lands used for commercial artefact hunting (rallies and detecting holidays) with stray artefacts. There are those who say it is going on (many metal detectorists) and those who say it is not (organizers of commercial events and their supporters). The discussion is a long-standing one, as is illustrated by a thread from a month ago on the "Minelab [Metal Detector] Owners" forum. The only place where you will not find this being discussed is that there is not a PEEP about any of this on the British archaeology forums. So, it seems appropriate to highlight the opinions expressed on the MLO thread: Are metal detecting rallys seeded?? Seeding does go on for sure like Jerry and a few others have mentioned above.We have been around and are not stupid, sometimes its so obvious. Personally I don't do rallies anymore because of it. I have been on rallies in the past where roman coins have suddenly started appearing after lunch where there were non in the morning. Like the others I am not mentioning any names but they know who they are. Basically its fraud, big monies are involved and people get greedy. Frankly it stinks, but the Americans either don't understand what's going or they don't care. I've lost one big farm as a result of the amount of cash offered to the farmer, I hadn't detected much of it so far but the finds had been pretty sparse. Its a shame really that any detectorists whether they are from the US or walls end are decieved in this way and is exploitation for financial gain period, and the sooner this sort of thing is nipped in the bud the better. im with you dave - ruins detecting in my view and corrupts the history of areas - and hearing that the digs are just for paying americans in the UK is criminal..... its not fair to take their dollars in such a deceitful way either. im disgusted. I'd also like to draw attention to the condition of the bulk of the coins coming out of the "Colchester" digs compared to other detected assemblages, almost as if they were the result of some form of negative selection. Why would that be? It should be noted that although the suggestion was made on 6th October to invite Chicago Ron to the MLO forum to give his answer to the points raised, no answer was forthcoming. "fifty p each for those thin silver coins, 25p for the ones cut in half, a hundred quid for all those old bits of metal in the boxes in the shed, hundred and fifty if you throw in those two metal detectors too". The clueless bereaved granddaughter who'd taken the week off work to clear out Gramps' old stuff may well agree, eager to get the property on the market, and a dealer somewhere is laughing. Too bad about Gramps, whose largely unfinished book on the "History of Piddling-Under-Gryme and the Surrounding Area" ended up in the skip. But " his" (not really) finds carry on giving pleasure. Then the unsuspecting FLO is happy when some nice hammereds turn up on a rally. The finder is over the moon, the landowner got a share of the ticket money, the PAS database gets bigger, the PAS looks better, archaeologists have more pictures of medieval coins to look at and dots on their distribution maps. It's what the PAS calls a win-win situation. Everybody is a winner? Millions actually. Our counter recently ticked past 11.5 million. It's sobering to think that most of those already are or soon will be the property of someone's deceased grandfather and that nothing else will ever be known about where they came from. and they will end up being sold by heirs who have not the foggiest idea what they've got and how much any of it is worth. CAIRO: Protests in Tahrir go on, the current series have entered their tenth day. The chemical weapon 'Tear gas' (more technically 'lachrymatory agent') these days can consist of a number of organic and inorganic substances. Obviously - quite apart from what it does to people - what is in it is of concern if clouds, or even traces of it are wafting into a museum containing delicate objects like the Egyptian Museum just off Tahrir Square. According to Wikipedia "common lachrymators include OC, CS, CR, CN (phenacyl chloride), nonivamide, bromoacetone, xylyl bromide and syn-propanethial-S-oxide ". Basically, most of them contains substances which will attack antiquities - like acids and chlorides. Large Celtic Horse Detector Find? We Are Currently Clearing Out My Grandfathers House, He Was A Keen Metal Detectorist.. He Has A Vast Collection Of Finds. My Mother Is Sure This Horse Was Found By Him Many Years Ago. We Cannot Guarantee This So Selling This Horse As An Unknown Item..It Is Beautifully Decorated, Looks Like Gold So Perhaps It Has Been gilted In Places... We Did Show It To A Local Detectorist. His Opinion Is That It Did Come Out Of The Ground As The Patina Is To Be Expected.. He Did Make Us An Offer But We Declined, We Will Gamble On Ebay.. If You Require Any More Photos Please Just Ask Me.. It's 200mm x 150mm (Oksanab2005, Bo[u]rnemouth, Dorset). Oksana (probably a friend of Candy) should have sold it to the detectorist. It's not celtic, it's a reproduction Greek figure in vaguely archaic style. Probably originally sold as a home decoration (IKEA had something vaguely like it three or so years ago as I recall), though decorative and rather sweet, worth only a fraction of the asking price. Oh, and the 'patina' is obviously chemical, so the "local metal detectorist" needs to get glasses, or stick to talking about what he actually knows about - which I'd say at a guess is probably not a lot. Note the way however "showing it to the local detectorist" replaces the notion of taking it to the museum, or to the PAS, it seems the beep-box boys are being seen by the British public as the real experts. Serves the archies right. Apart from the fact that this sale seems to mark a personal tragedy (note the present tense in the second sentence), this is a very good illustration of a very important issue, what happens to all those hundreds of thousands of dugup finds being temporarily kept in ephemeral and poorly-documented personal collections when the artefact hunter no longer is able to look after them? How are the heirs going to know what is what? The film shows mainly the abandoned and now heavily eroded archaeological excavations, the collapse of part of the roof, but also extensive hole digging around which seems not to be the result of systematic archaeological research. Mari is one of the sites featured on the Department of State's 2014 presentation of the satellite evidence of looting. Just over fifteen years ago British archaeologists decided they were going to STOP asking "Stop Taking Our Past" and switch to a message of "Fill Your Boots, But Show Us Some" (Fi-YoB-SuS) otherwise known by the less cumbersome acronym PAS. Since then collector have been filling their boots. The archaeologists' original idea of Fi-YoB-SuS however was that by inviting collaboration (offering friendly "partnership") and gentle persuasion, artefact hunters could be educated to adopt "best practice". That pretence was long ago dropped, and "outreach" though costing more than ever before, has taken a far less ambitious form. Edukashun is not exactly what artefact-grabbing artefact hunters want ofr are good at. One individual however has announced that he's going to give it a go. He's going to get some edukashun by doing a "Landscape Archaeology course at my Uni down the road". Now that is wonderful, the pro-tekkie mantras are full of the (false) notion that "doing landscape archaeology" is what metal detectorists hoiking away at the archaeological record in the fields within driving distance of their homes are doing. It is, the spenders of millions of pounds on "outreach and liaison" assure us, a short step from them "studying" the archaeological record in situ and helping preserve it - innit? We are all wondering that too. Greggo may "wreck", would an educated detectorist not? Gaining more knowledge could put a UK artefact hunter in the awkward position of seeing the damage artefact hunting does in its present form. Could make Fi-YoBbers uncomfortable. Dangerous stuff for the 'obby, edukashun. 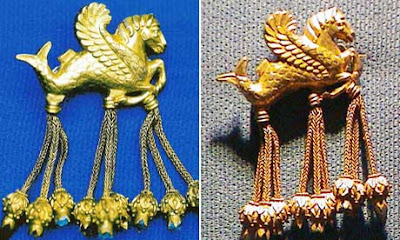 The Guardian had a text yesterday (Constanze Letsch, 'King Croesus's golden brooch to be returned to Turkey', Sunday 25 November 2012) concerning the return to Turkey of the winged hippocampus pendant brooch stolen from Usak Museum. The article is notable for the photo of the real stolen object and fake side-by-side. The original, left, and the fake golden brooch in the shape of a winged hippocampus from the Lydian Hoard in Turkey. It seems to me that the differences apparent in the photo are more a function of the difference in the way the two are lit. It looks very much from these photos as if the fake has not been modelled, but made from a cast of the original. It would be interesting to know more about the technology of manufacture of this fake, including the precise composition of the gold and gold wires. After that, I'd like to see the fake auctioned-off to raise money for heritage protecting in Turkey. A tantalising possible hint as to how the stolen original was found is also given, a "culture and tourism official", Serif Aritürk is quoted as saying: "No collector would have dared to acquire such a well-known artefact, it was clear that the thieves would not find a buyer easily". Was it actually found still in the hands of a Turkish member of the original gang now based in Germany? Another sting by police agents posing as buyers? Was the seller arrested and will he be charged? Over on another blog it is unobservantly suggested that no information is available about what "the Turks" will do to "safeguard" this piece of cultural property once they have it back. The author presumably has not seen the several news articles referring to it being housed in the National Museum in Ankara before being taken to the new museum being built in Usak. The Guardian gives the additional information that the larger museum being built to display the 450 pieces of the Lydian collection in its entirety is due to open in December 2013. As the fallout from the so-called "Arab Spring" disrupts the old world order, somebody is profiting from the unrest. Coin dealer Wayne Sayles reports sales of Islamic coins are on the up-and-up. As an example we may take the "James Theselius Collection", "a highly important collection of Islamic coins", one of the largest US private collections of Islamic and Turkoman coins to be sold in recent years. And Wayne Sayles is selling it. This was created through a series of purchases over two decades (so all relatively recently) "from major auctions in the U.S. and abroad as well as from bourses primarily in the Midwestern U.S." and consisting of "approximately 800 coins from the Ummayad (sic) Caliphate to Persian Civic Coinage with a heavy concentration on coins struck under Turkoman, Ilkhan and Central Asian dynasties". This "important collection" is now being split up apparently without having ever been properly studied and published first. The remains are however selling like hot cakes. "The popularity of these nonclassical coins among [US] collectors is increasing every year", says Sayles. "Of the nearly three hundred lots posted for sale to date, about half have already been sold, new lots are being posted on a continuing basis". US coineys have a set of stock arguments explaining why they really should not be asked to collect dugup ancient coins with any thought for their precise origins and the effects of their activities. One of them is that the coins of "the Glory that was Greece and the Grandeur that was Rome" are THEIR heritage, as the United States of America is the only true torchbearer of the democratic and republican ideals embodied in the Englightenment. The rest of us are just "retentive cultural property nationalists" unworthy to stand beside them in that regard. I'd like to ask just what institutions they see in the United States of America as having their roots among the Turkmen states of the Near East and Central Asia. Not so long ago they were proclaiming a Clash of Civilizations, now the American neo-colonialists of Globalization want to rip off the heritage of Islamic nations too and claim it for their own. What do they give in return? US-made tear gas cylinders in Tahrir Square, "Reverend" Terry Jones, and political assassination drones is what comes first to mind. "earns respect for having accomplished something of purpose and value [...] to the numismatic fraternity [one that ....] adds to our overall knowledge and appreciation of numismatics as an art and science [or...] might provide insights that enrich the understanding of other disciplines. This "highly important James Theselius Collection" which Sayles is now selling off piecemeal, with its wide geographical and chronological scope, what purpose and value (apart from financial profit) has its accumulation achieved? Collector James Theselius is/was the author of which monographs on early Islamic social and economic history (or even coin typology/iconography) based on his extensive coin collection and its close study? Or on Roman Egypt based on the ones flogged off in 2008? Or did this collection simply serve as a private wotta-lotta-stuff-I've-got trophy for him? What "insights" did collector James Theselius' 800 coins imported to the US goodness knows from where, when and how, individually or collectively contribute to "enriching the understanding of other disciplines" (such as archaeology)? Let Mr Sayles produce the full bibliography of the intellectual fruits of this "important collection" and its study before he flogs any more off. Those "Turkmen" realms that so excite Wayne Sayles (cos their coins have pictures on them) are more or less in the middle of this map. So Theselius got a lot of ancient dugup coins from these countries. Many of the countries shown in brown on this map have legislation which makes any ancient objects found in ths soil the property of the state and people of those countries. Walking off with them is therefore theft. Jesus reputedly ate with thieves, but there is no record of him buying stolen stuff from them. So, to what extent did Rev. Theselius ascertain or care that these ownership laws were not violated in the removal of these objects first from the archaeological sites where they were found, and then the country to find their way to "borses and auctions" half way round the globe in the New World? To do that' he'd have to have a record of their collecting histories. Did he have a documented collecting history for each and every one of those 800 coins? If not, what is Wayne Sayles (aparently a dealer careful about his "reputation") doing handling them? How can he say that he gives a buyer "clear title" to objects which he cannot himself document his own clear title to? Obviously the fact that, despite this, he's managed to flog off "about half" of what he had on offer to date indicates that he is catering for clients who could not give a tinkers about where the coins they are buying come from, and how they got there. So, as the fallout from the so-called "Arab Spring" disrupts the old world order, criminals in source countries will easily profit from the unrest by stealing, smuggling and selling off dugup antiquities of all kinds to foreign collectors who will willingly buy and circulate on the market any nicely-priced fresh stuff, no-questions-asked. Sales of freshly surfaced Islamic coins will continue to be on the up-and-up. Wayne Sayles: "Archaeologist Barford endorses WGS Store". Ummm, is that what I say? It has long been obvious to me that, like metal detectorists in the UK, US coineys have some problems with the written word. Coin dealer Wayne Sayles manages to read a post of mine from the beginning of the month as an "endorsement" ('Archaeologist Barford endorses WGS Store'). Since I have done nothing of the kind, one can only conclude that senility is taking its toll on the ACCG crowd from the Executive Director down. What a buffoon. Who, with an IQ higher than 85, sees an "endorsement" there? A few months ago, Mr Sayles announced (at a CPAC hearing) that he had gone into retirement as a dealer. He also seemed to have tired of bickering with archaeologists and preservationists. At the same time he actually deleted all the posts on his blog attacking opponents of the no-questions-asked market such as myself and Nathan Elkins, the ones about "Goose-stepping" and "space cadets" and other suchlike insults. It really did look for a time that the blog "Ancient Coin Collecting" was actually going to be about the collecting of ancient coins. In response, I determined that I'd not write on this blog about the old man any more; if he was handing over the lobbying and aggro to others, I figured, let him enjoy his retirement in peace. I even came close to deciding to delete all my old posts about things he'd written or said. It is a good job I did not, as he's back with his old tricks and they are still applicable. So he wrote some nonsense post about "analysis" of "Turkoman" coins (astrology crap). I left the topic unremarked. Before that was the cringingly-embarrassing "Open Letter to Paul Ryan" (immediately reminiscent of a category of loyalty-expressing literature over here in Communist times [shudder]). Sayles wrote the other day one about "important collections" which raised some questions in my mind. I left it. Then he comes out with this absolutely unprovoked and wholly preposterous misrepresentation of my own personal position about this kind of selling. Well, that certainly looks like the old Wayne Sayles is back with his accustomed brand of provocation, the puerile quest to annoy and elicit a reaction. "each item on the WGS Store is sold with a guarantee of authenticity and of clear title". He says store practice in this regard is is "in keeping with [his own] recommendations posted on this blog last year". Those recommendations however begin "ACCG members have asked what they can do to assure that the purchases they make are legal" - bla bla. As is quite clear from the pages of this blog, given the current utter hopelessness of the majority of legislation concerning commerce in dugup antiquities, I am less concerned with mere staying-within-the-law legality than with issues of responsibility and ethics among those that commercially handle archaeological artefacts. This, it should be clear from the pages of this blog ("the context"), is for me the key issue in the trade in such a specific commodity as dugup antiquities. It should therefore be obvious to all but a simpleton that I am not going to "endorse" anything which does not uphold the same values. From all that he has shown us so far, it is my opinion that the WGS online coin store falls well short of what I would be looking for in a dugup dealer if it were desirous of winning my "endorsement". "Who" Mr Sayles is is neither here nor there, what matters is where each individual item he offers have come from, how they left the source country and through whose hands they passed. Mr Sayles admits that he can only give "a "best knowledge and belief" statement" and this is because "ancient coins do not come with a title like an automobile". Well, wait a second, if he cannot ascertain (from the item's documentation) that he has acquired dugup antiquities of foreign origin without the ability to actually guarantee title (because he has not been able to determine with 100% certainty whether the coin has legally left the source country), then any dealer's 'word' that the purchaser has acquired a licit coin from him is simply not worth the paper it is written on. It's just empty words of an old man expressing wishful thinking and expecting everyone to believe him and not ask any questions. We note that Sayles in the recommendations that he wrote to support his brand of commercial activity Sayles says: "The prospect of seizure of coins from law abiding rank and file collectors is remote and is not a cause for undue concern". Is that it? All he's doing is guaranteeing that whatever else, US authorities will not raid the homes of "rank and file" (eh?) coin collectors who have a piece of paper signed by a "retired" dealer who is not-really-retired? That is he is offering "they cannot-touch-you-for-it" free title"? This is his definition of "responsible collecting" - a responsible collector leaves no traces to incriminate himself (and buys from dealers who keep no documentation to incriminate themselves)? It should be obvious that this is not a definition of "responsible collecting" of items such as dugup archaeological artefacts that the author of this blog would endorse, far from it. I am sure Mr Sayles will correct me if I am wrong, but it seems to me that what he is offering is certification that by choosing to buy coins from "WSG Antiquarian", purchasers have "a reasonable expectation that title is clear and transferable before purchasing" a dugup antiquity from him. That's what the executive Director of the ACCG will give them a piece of paper saying. This is what he is telling his customers gives them 100% immunity under US law from having their coins seized. Then in the next breath he tells us that some of the coins he is currently handling come from a collection formed by "buying from major auctions in the U.S. and abroad as well as from bourses primarily in the Midwestern U.S.". But that in itself tells us nothing. It primarily through such venues and their no-questions-asked practices down through the years that illicitly-obtained coins enter the market and continue to circulate within it, laundered by the anonimity offered by no-questions-asked dealings. (Presumably Mr Sayles will deny that, assigning the blame to "coin elves"). So, if Sayles cannot obtain from his supplier precise information about how those coins entered the market, how they ended up in those "auctions in the US and abroad" and 'bourses", then the coins he buys from them are tainted and he has no business guaranteeing that they are of licit origins when he is unable to actually ascertain that. So I ask again, what does dugup coin dealer Sayles understand by "guaranteeing clear title" in the specific case of selling dugup ancient antiquities? 1) The laundered- (missing)-collecting-history "they"-can't-touch-you-for-it based on the trade obscuring origins? 2) Or the one based on transparency "I have checked the documentation of this particular item's collecting history (and pass on a copy to you, the buyer) and give you a 100% unconditional guarantee that this item is of wholly and uncontestably licit origins - take a look at the documentation here yourself"? There is a HUGE difference between the two, as I am sure everybody with an IQ over 85 can see. Certainly I would endorse any seller that can legitmately (verifiably and consistently) make the latter claim, that is after all what one would understand by the term "legitimate market in portable antiquities". Anything LESS than that would not get my endorsement as a seller of dugup antiquities. Nor, would I imagine would it get any kind of endorsement from many an archaeologist, whether they collect antiquities or not. It has been announced that the Uşak Hippocamp, an item of gold jewellery which had been missing since it was stolen from the Uşak Archaeology Museum in Turkey in 2005, has been found in Germany and will be returned to Turkey soon. The pendant brooch was discovered to have been stolen from the display and switched with a fake some time between March and August 2005. No information has yet been revealed as to how it was found. Speaking at the 31st İstanbul International Book Fair on Wednesday [Turkish Culture and Tourism Minister Ertuğrul] Günay said [...] “The treasure worth millions of [Turkish] lira, known as the Winged Sea Horse, the most precious piece in the Croesus Treasure, which was stolen from the Uşak Archaeology Museum in 2005, has been found and secured in Germany. An agreement that the artifact belongs to Turkey has been reached between Turkish and German authorities. We are following the legal proceedings. I believe the Winged Sea Horse, which is vitally important to the Croesus Treasure, will be brought back to Turkey by the New Year or in early 2013.” Günay also said that a new museum will be built in Uşak and the Winged Sea Horse Brooch will be on display in that planned museum. However, the brooch will be displayed in an Ankara museum until the museum in Uşak is built. The theft of the hippocamp came as a huge embarrassment to Turkey and anti-illicit-antiquity campaigners. It was one of the star exhibits in the so-called "Croesus Treasure" ("Lydian Hoard"/ "Karun Treasure") , a collection of 363 artefacts from the time of King Croesus' rule of the Lydian Kingdom between 560 and 547 B.C.. The hoard originating from Uşak province in western Turkey was the subject of a legal battle between Turkey and the Metropolitan Museum of Art in New York from 1987-1993. The artefacts were returned to Turkey in 1993 after the museum admitted it had known the objects were stolen when they had purchased them. Twelve years later it was discovered that the hippocamp had been taken. The director of Uşak museum, Kazim Akbiyikoglu, was convicted of theft along with nine accomplices in February 2009. 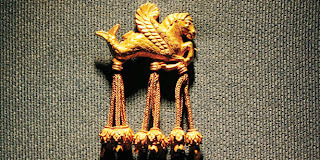 Zaman, 'Famed Winged Sea Horse Brooch in Germany, to be returned, minister says', Sunday's Zaman, 21 November 2012. Doğan News Agency, 'Karun piece found in Germany', Hürriyet Daily News November 25 2012. Sharon Waxman, 'Chasing the Lydian Hoard', Smithsonian.com, November 14, 2008. [Neil Brodie? ], 'Lydian Treasure', Cultural Heritage Resource of the Stanford Archaeology Center 12 Mar 2009.
possible information has emerged only that "it was found in German province Hagen, the piece was kept in safe deposit boxes of German Central Bank". Hagen is in the federal state of North Rhine-Westphalia. Is Pompeii an ancient or a modern wonder? Its ruins have been rebuilt and the bodies of the volcano's victims are plaster casts, says classical historian Mary Beard. our Pompeii - like most classical sites, in fact - is the product of collaboration between modern rebuilders and conservators, and the original Roman builders themselves, with the lion's share of the work on our side. And it's no less impressive or moving for that - as the body casts help to show. 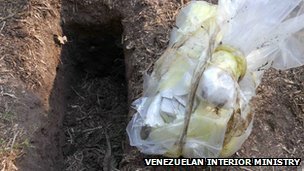 Security forces in Venezuela have found $550,000 buried in six plastic bags full of $100 bills. The deposit had been hidden on the banks of the river Meta in Apure state near the border with Colombia. It was hidden along with a rifle and 1kg (2.2lb) of cocaine. Counter-narcotics officers said the money belonged to an international drug trafficking gang which also stored fuel and small aircraft in a camp nearby. They said the camp was used to smuggle drugs from Colombia to Central America. Over the past months, Venezuela has arrested and extradited several high-profile Colombian drug dealers. Colombian guerrilla groups and drug traffickers often bury cash in remote locations. It is not of course beyond the bounds of possibility that at least some of the hoards buried in various parts of the Roman Empire and dug up by treasure hunters and sometimes sold off on the black market were similarly hidden proceeds of ancient illicit activity, being utilised in modern criminal activity. Many beautiful and historically significant coins and artefacts have been found and reported by archaeologists, field walkers and metal detectorists who have used the ARCHI database for their research. The 155,000+ UK archaeological sites listed in the ARCHI database also contains links to maps and aerial photographs enabling you to [...] pinpoint the exact locations of the sites recorded in the database on the ground [...].The data within ARCHI has been sourced from a wide range of publications ranging from specialist books to the "mainstream" archaeological journals such as Britannia, Council for British Archaeology Reports etc. Additionally, data has been sourced from archaeological surveys published by various Local Historical / Archaeological Societies and Field Groups. have also teamed up with Time Line Auctions who have published their latest calendar of forthcoming Antiquities and Coins Auctions which we hope will also be of interest to you. We are currently inviting entries for our next catalogue sales and eAuctions of Antiquities and Coins. Entries must be received by the date in table below. we are buying... What a partnership, ARCHI trawls as much archaeological literature that it can get its paws on, extracts the data pinpointing likely 'productive' sites of interest to artefact hunters (euphemistically referred to as "amateur archaeologists with metal detectors"), the latter go out and find lots of "beautiful and historically significant coins and artefacts" which they send off to the house in Upmister which flogs them off with a lot of other stuff. Lots and lots of other stuff. I've discussed some of it on this blog. So what kind of metal detectorist is going to take advantage of such a "partnership"? Is it responsible to target known sites, the location of which is extracted from archaeological reports, while at the same time artefact hunters REFUSE to allow publication of accurate findspot details of what they take from such sites? Is it responsible metal detecting to sell artefacts obtained in that manner alongside some of the other stuff that Timeline sells? And its all legal and even does not contravene even the official "Code of practice for responsible Artefact Hunting in England and Wales" - but is it right, is it ethical? What do you think? A more advanced metal detector which is capable of detecting different precious metals inside the human body has been finally introduced to the world by Protective Technologies International (PTI). The metal detector XVS 10mi is sensitive enough to detect even the smallest metal amounts [...]. When will they be installed in airports? Where is Tarek El-Awady Now? Australian Cultural Property law Impotent? Another Coin "Changes History" Really? PAS Says Proculus Coin a Fake? Foolish Talk to Fool, or for Fools? "Nobody Wants to Deal with the Accused". Really? "Let the Buildings Crumble, Fund the PAS"
Dozing Rip van Archaeol Will Ignore THIRD Letter? Crack in the Art market? Am I a Neo-colonialist too?